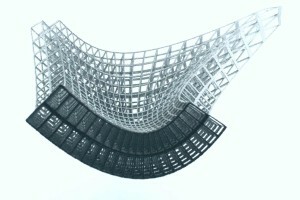 Within the context of material architecture, our focus is on cellular solids, either artificial, e.g. microtruss, or natural occurring, e.g. plant tissue. A cellular solid can be loosely described as a partition of a solid with voids. Voids can be randomly arranged, such as in foams, or follow a periodic pattern, as in a lattice. At times, a periodic cellular material can resemble a tiny truss structure consisting of repeating units made of members connected at nodes. Other times, the voids outline a configuration that is far from being a space framework. By tailoring the architecture of the unit cell, in particular nodal connectivity and strut/solid configuration, and by controlling the distribution of voids, we can engineer a new material with unique attributes that can access unexplored areas of the material property charts. 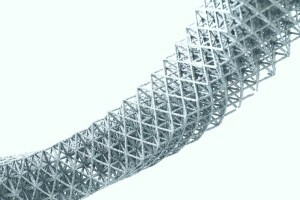 Recent advances in manufacturing enable to build complex lattice components at multiple length scale with high accuracy, acceptable costs and from a variety of solid materials. There is an enormous promise to fabricate planar and three-dimensional cellular solids with microarchitectures that yield the material unprecedented physical responses. Our activities contribute to fulfilling such potential with efforts that fall across the spectrum of fundamental and applied research.